Nothing was more valuable in our history of evolution than writing. In the beginning, that meant drawing shapes on the roofs and the walls of caves, but as time passed and human memory was not enough anymore to keep track of everything, writing became the most important form of storing and transmitting knowledge. For that purpose, man invented the pen. Out of all the types used back in history, you might have the image of a quill in your mind. The quill was only one of the types of pens that preceded today’s Fountain Pen. The Fountain pen was introduced to mass production in the mid-1800’s though there are some very early historical mentions. Almost one century later, it lost some popularity to the more easy to use ballpoint pen, but today it’s having a revival. The fountain pen is still regarded as a fine and superior instrument for writing, with its smooth flow on the paper. But the fountain pen it’s much more than that. A fountain pen is a statement of style. Among the many types that exist, there are some fountain pens that rise to the level of art. These are luxurious artifacts treasured by many but owned by few. Geneva based Maison Caran d’Ache created the 1010 Limited Edition to honor the Swiss watchmaking culture. The name illustrates the perfect balance of the hands of a watch, balance that occurs at 10 minutes past 10. 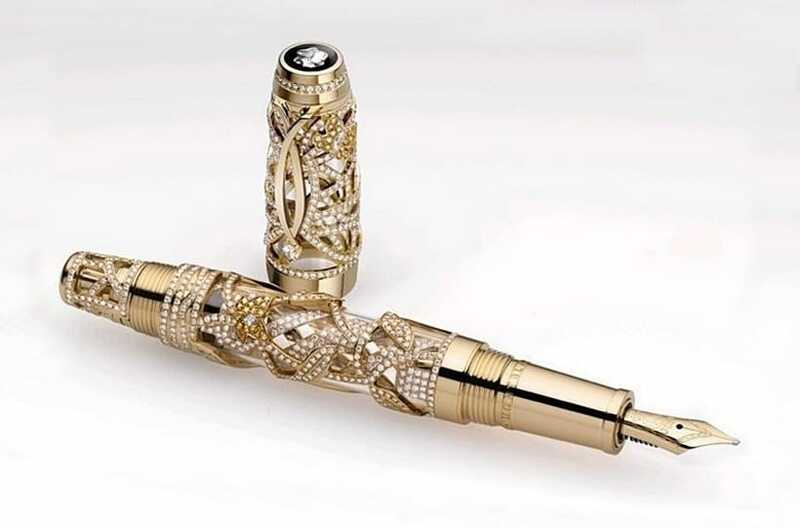 The pen was crafted from 18 karat gold with an added Top Wesselton VVS 0.11 carats Diamond with 57 facets and it’s decorated with elegant gear wheels built and polished by hand with extreme care and attention to detail. The nib is made of 28 karat gold and the design resembles the complex mechanisms of a watch. This artful writing instrument comes with a price tag of $175,000. The German luxury manufacturer MontBlanc created another masterpiece in the form of the Boheme Papillon Limited Edition Fountain Pen. The collection features pens in solid white, yellow or rose gold, all of them adorned with no less than 1400 diamonds and sapphires that are excellently combined to form shapes of butterflies and plant tendrils on the body of the pens. 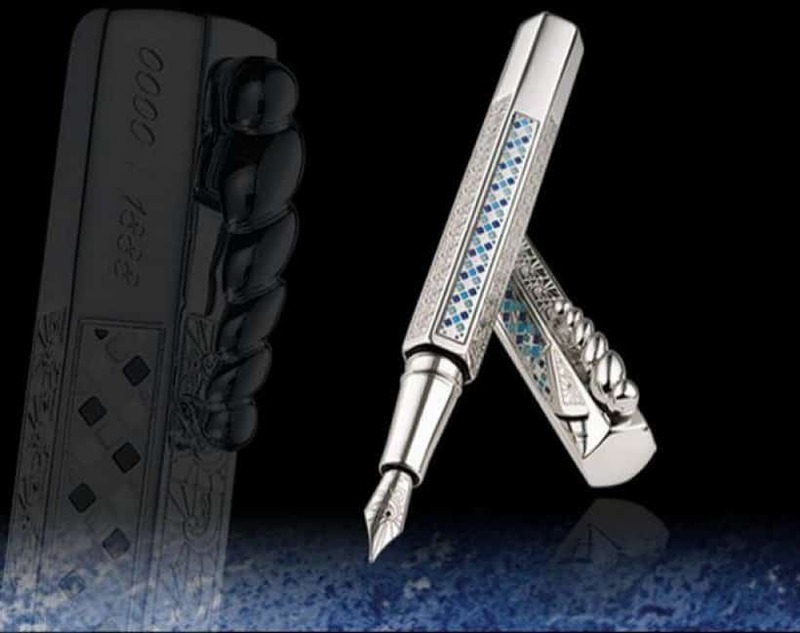 The cap of the pen sparkles with its patented signature, a star-shaped MontBlanc diamond. But the price shines out as well. One of these beautiful pens costs a hefty $230,410. Another masterful creation from the same maker is the MontBlanc Prince Rainier III Limited Edition 81. This fountain pen is a tribute paid by MontBlanc to Prince Rainier III of Monaco, who passed away at the age of 81, hence the name of the item. 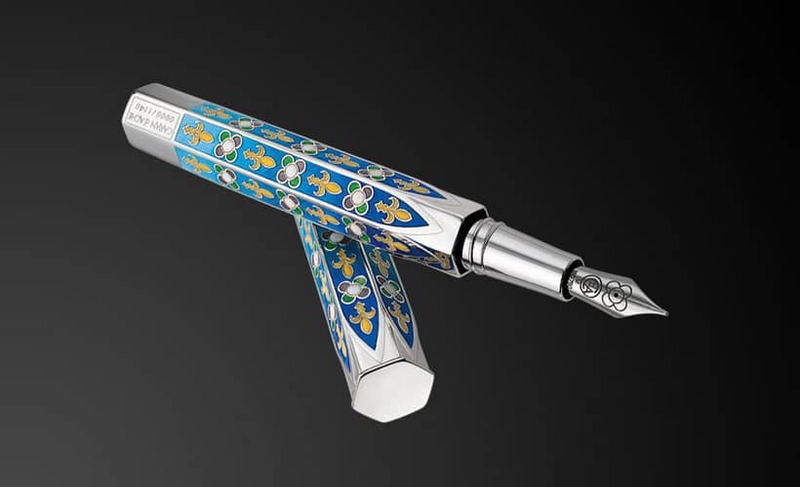 The body of the pen is made of 18 karat white gold and bedecked with 996 diamonds and 92 rubies in a design that resembles the pattern on Monaco’s coat of arms. Two rubies adorn the 18 karat gold nib and 19 more were added on the clip ring on the cap of the pen. The price for this masterpiece is $260,200. 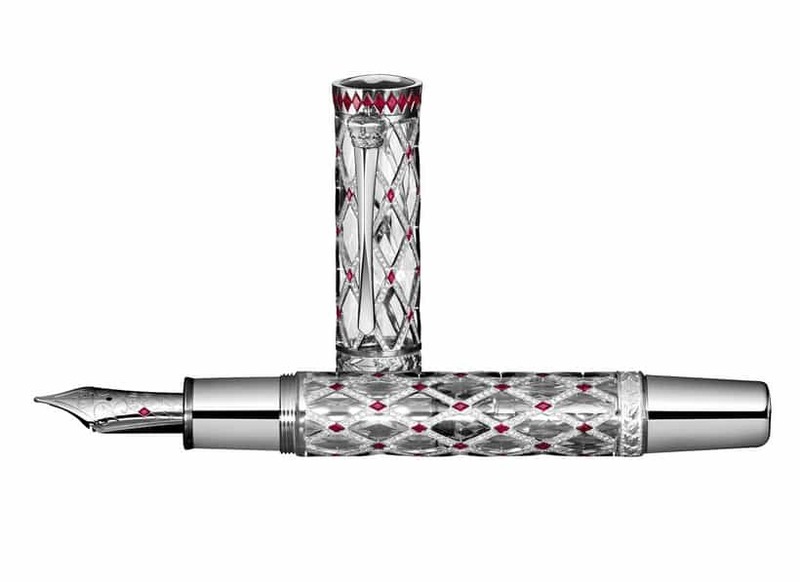 The Swiss company Caran d’Ache brought to the world another classic, the La Modernista Diamond fountain pen, as a beautiful homage to one of the best architects of his era, the Spanish Antonio Gaudi. 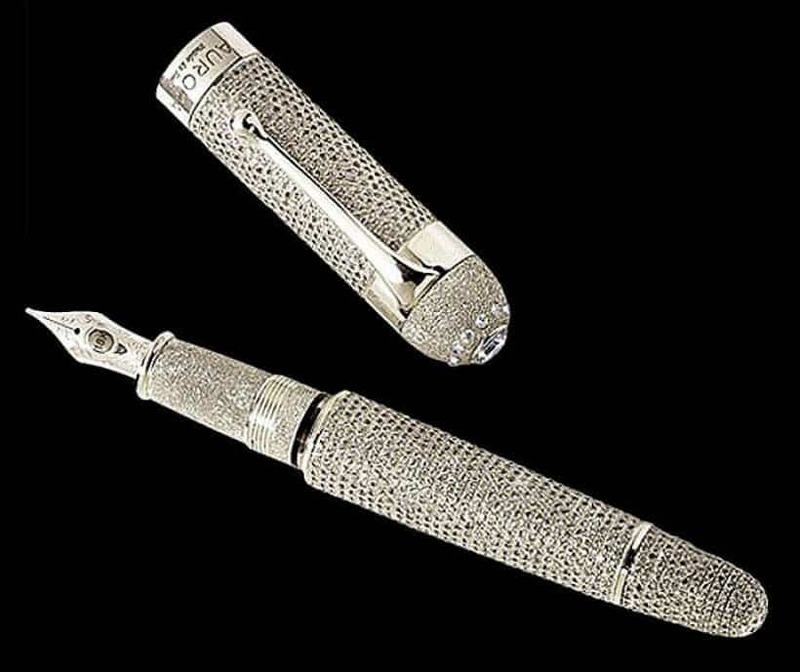 Crafted with over 5000 diamonds and 96 rubies and featuring a rhodium coated 18 karat gold nib, the body of the pen resembles a historic monument to remind of the famous architect. The pen comes with a price tag of $275,000. 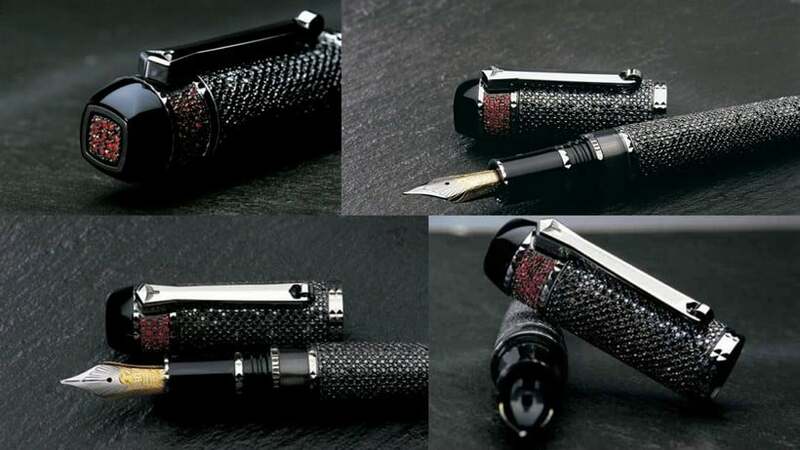 Maison Caran d’Ache gets another place on this list with the Gothica fountain pen, a limited edition writing instrument made to bring back memories of the Gothic art and architecture. The body is crafted from rhodium coated sterling silver with a design that abounds with the Gothic symbols fleur de lis and rosette in luminous colors on the six sides shaped as a Gothic window. 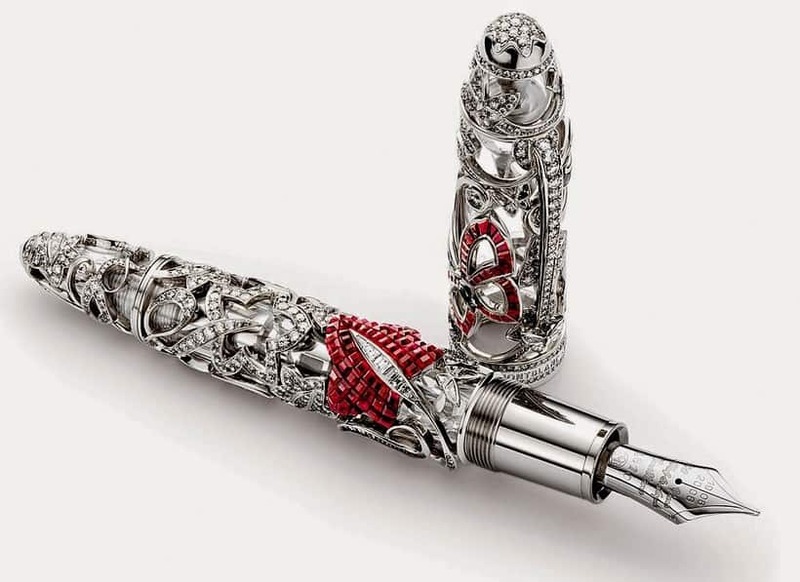 The price for this pen is an outstanding $406,453. 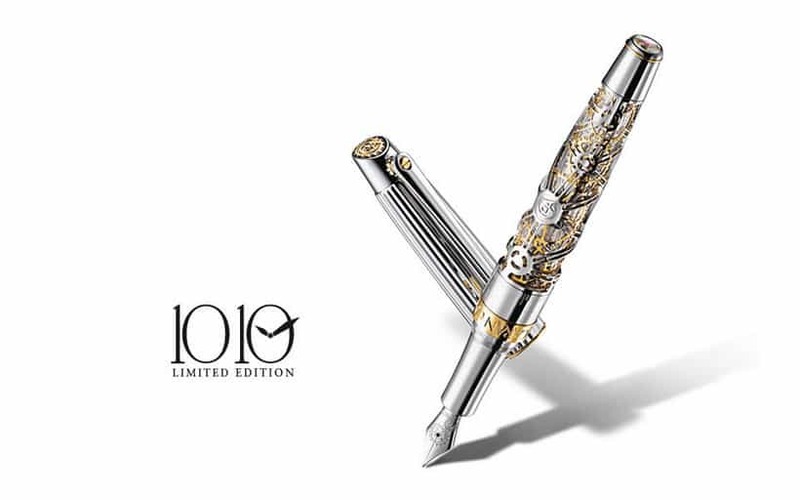 The Limited Edition Mystery Masterpiece is a collaboration between the famous MontBlanc and Van Cleef & Arpels, a collaboration that spawned one of the most prestigious writing instruments the world ever saw. Sapphires, rubies and emerald are the three options available to contrast with the pen’s 840 diamonds encrusted in the white-gold body. There were only 9 of them created, in celebration of both companies’ first century of crafting luxury accessories. The price for one of those magnificent pens is a whooping $750,000. 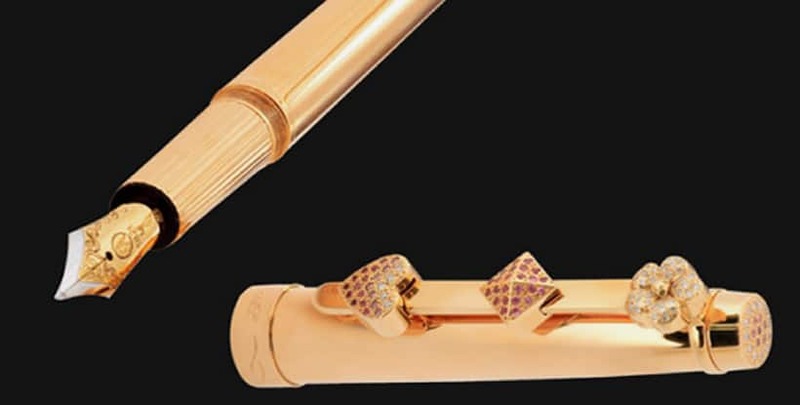 Coming from the Canadian jewelry designer Anita Mai Tan, the Heaven Gold fountain pen is regarded as the first luxury pen designed by a woman and destined to women. Why? Easy answer. Pink. The pen is made out of pink gold and its body is adorned with 161 brilliant cut diamonds and 43 carats of 2 billion years old Tsavorite gemstones. Would you be ready to drop $1 million for a fountain pen? And not only that, but a pink one? This piece of art is the same as number 10 on our list, but with a little very very expensive difference. Diamonds. 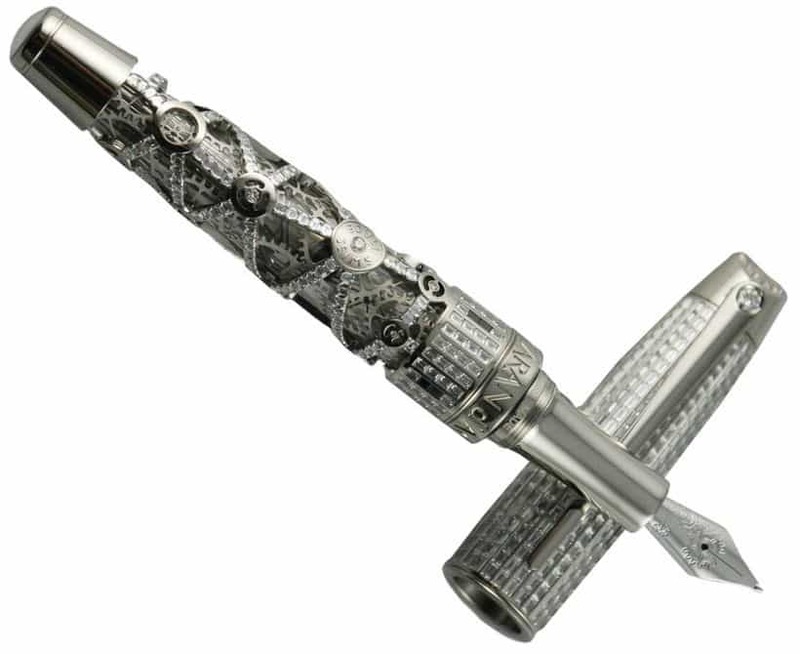 There are over 850 pure diamonds encrusted on the pen’s body, totaling to 24.61 carats. Besides the huge price of $1.2 million, there’s another downside. This pen is unique in the world, the one and only ever made, so you need to be extremely lucky to get your hands on it, even for a second. Or for a few written words. 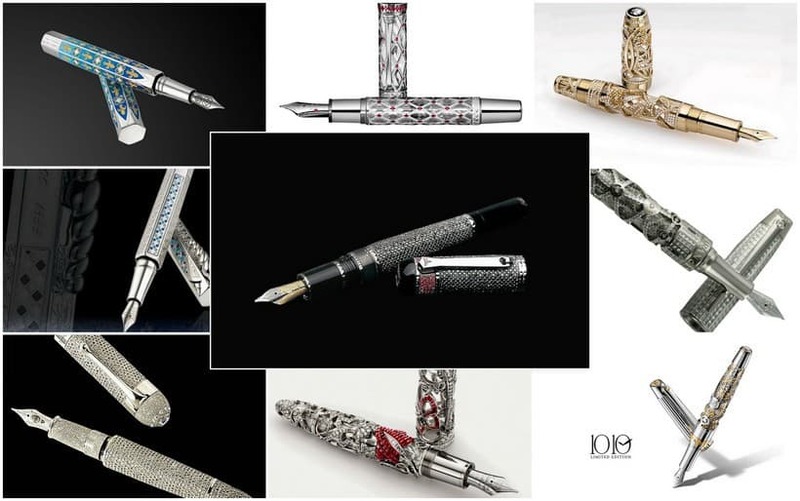 The Italian based luxury pen manufacturer Aurora created the Diamante, a wonderful combination of craft and art. 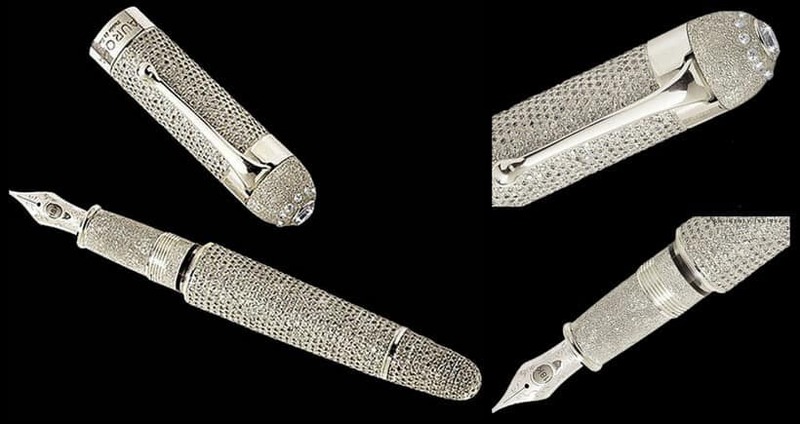 This writing instrument is a masterpiece of solid platinum covered with over 30 carats of DeBeers diamonds and a 18 karat gold nib. There’s only one created each year, making it one of the most sought-after collectibles. 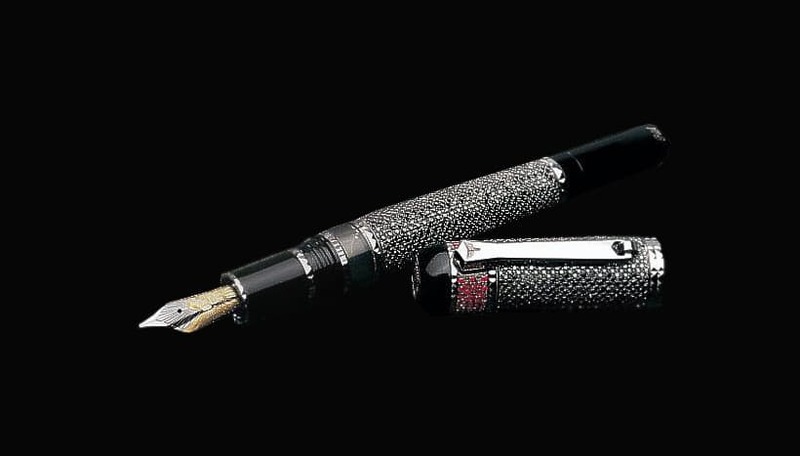 It used to be the most expensive pen in the world for its huge price of $1.47 million. With a name to impress anyone, The Fulgor Nocturnus was created by the most important Italian fountain pen manufacturer, Tibaldi. It was crafted after the divine proportions of Phi, so when the pen is closed, the pen’s cap in relation to the visible part of the barrel equals the ratio of 1:1.618. It’s decorated with 945 black diamonds and 123 rubies and only one was ever created, making it that much more coveted. But the most impressive fact is that the Fulgor Nocturnus fountain pen was sold for the colossal sum of $8 million in a 2010 auction in Shanghai, China, thus becoming the most expensive fountain pen ever created. The post The Top 10 Most Expensive Pens Ever Made appeared first on Luxatic.